Produce reliable resource & reserve models using functions such as optimised compositing, orebody unfolding and mineable shape optimisation. Same time & reduce errors on sites by capturing & automating pieces of workflow to reliably carry out repetitive & complex tasks. 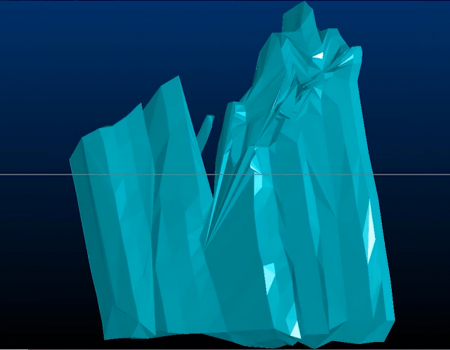 Wireframing & automatic structural modelling tools that help define geology quickly & accurately. With a proven track record of over 30 years, Studio RM is Datamine’s industry leading product for mineral resource and reserve evaluation. Use Studio RM to produce resource and reserve models that accurately represent geological structure, mineralisation and grade, whilst handling complex data sets such as drillhole samples, channel samples, georeferenced images, face maps and laser and image processed 3D models. With its new activity-based user interface and multi-parametric modelling capabilities, Studio RM is even more powerful and easier to use than its predecessors. It can deliver corporate resource and reserve information with the quality, accuracy and reliability required by geologists, management and downstream users. Studio RM has the required auditability, repeatability and functionality to produce resource and reserve statements according to the standards demanded by the JORC, SAMREC, NI 43-101 and Guide 7 reporting codes. Variography, kriging neighbourhood analysis & estimation, dynamic anisotropy, orebody unfolding, conditional simulation, classification and reporting, and uniform conditioning. Mineable shape & stope optimisation. Implicit & explicit automatic structural modelling. Sample analysis, domaining & compositing. The Studio platform has a comprehensive set of processes for manipulating mining data. Coupled with its automation capabilities Studio products can be reliably implemented in operations which have multiple and occasional users. For more video tutorials and updates, subscribe to our YouTube channel or follow us on LinkedIn.